Can Dogs Eat Shrimp? Is Raw or Cooked Shrimp Safe For Dogs? You are here: Home / Food / Can Dogs Eat This? / Can Dogs Eat Shrimp? Is Raw or Cooked Shrimp Safe For Dogs? Would you like to share your tasty shellfish treat with your dog? “Can Dogs Eat Shrimp” looks at the pros and cons of feeding shrimp to dogs! You may have a lot of questions about feeding your dog shrimp. Can dogs eat cooked or raw shrimp? Are shrimp shells and tails safe for dogs? Are some dogs allergic to shrimp? What are the warning signs for an allergic reaction if your dog ate shrimp? Is it okay to feed shrimp to dogs? We’ll answer these questions in this article, part of our library of healthy eating guides. Shrimp are decapodous (ten-footed) crustaceans in the same order as prawns, crayfish, lobsters and crabs. They consist of a small, soft, edible body inside a flexible shell with a semi-rigid tail fin, small legs and tentacles on the head. These tasty sea creatures represent more than ten billion pounds of seafood consumed annually! Jumbo, Gulf, cocktail. Battered, buttered, broiled and boiled. From dive bars to fast food joints to five-star restaurants, this delicious seafood is everywhere. So it’s natural to want to share this delicacy with our canine companions. But can dogs eat shrimp? Or might it cause them tummy troubles? Let’s explore. Is Shrimp Bad for Dogs? Properly prepared shrimp is safe for dogs to eat occasionally. However, a few words of caution before you start feeding it to your dog. If your dog is diabetic, overweight or has circulatory problems, it’s best to avoid feeding him shrimp. Shrimp are high in cholesterol, and excess cholesterol can contribute to circulatory complications such as hyperlipidemia, or high lipid/fat content in blood. While the occasional small amount of shrimp would not be the sole cause of hyperlipidemia, maintaining a diet with reduced cholesterol is recommended for dogs who already have this issue. If your dog has a thyroid condition, avoid shrimp. Shrimp, and shellfish in general, are a common source of dietary iodine and its consumption can aggravate an existing thyroid condition. 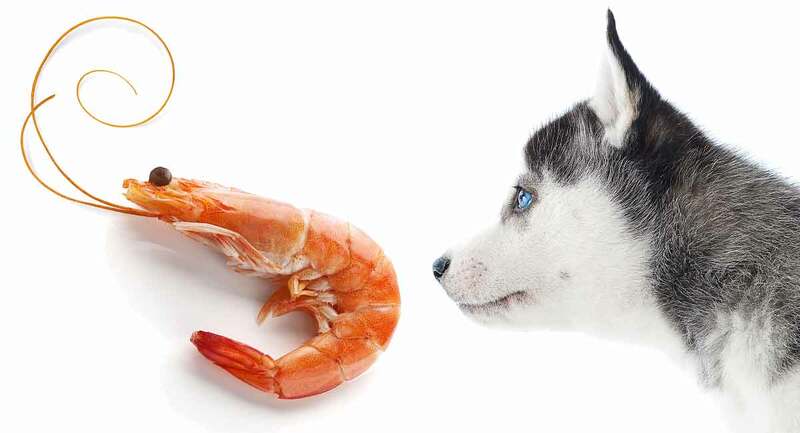 Are Dogs Allergic to Shrimp? It is possible for some dogs to develop an allergy to shrimp. Any dog, including yours, could develop food allergies or have a genetic predisposition to food allergies or sensitivity. Although foods generally account for only ten percent of allergies in dogs, it is best to limit shrimp for your dog until you are sure there will be no allergic complications. If your dog has known allergies or sensitivities to other foods, it is best to avoid the risk of a reaction and not give your dog any shrimp. The first time you give your dog shrimp, give him a small, fully-cooked piece and watch him carefully for any signs of a negative reaction. These may include aggressive scratching of the skin or ears, head shaking, difficulty breathing, diarrhea or vomiting. If you notice any of those symptoms after your dog eats shrimp, contact your veterinarian immediately. It is possible that the shrimp caused the problem, and it would be best to avoid feeding your dog shrimp in the future. Dogs can develop food allergies at any time, not just when there is a change in diet, so don’t disregard any of these symptoms that occur after shrimp has been eaten by a dog who has previously had shrimp without symptoms. You might be tempted to have your dog tested for an allergy to shrimp, but be aware that a 2017 study indicates that current food allergy testing methods for dogs, including blood tests, are not proven to be effective at identifying food allergies. Occasional treats of this low-fat shellfish can play a beneficial role in your dog’s diet. Aside from being tasty, shrimp are packed with a healthy combination of antioxidants and important nutrients such as vitamin B12, niacin and phosphorus. Vitamin B12 is a common supplement that is important for proper metabolism, gastrointestinal well-being and brain health. Niacin, or vitamin B3, contributes to your dog’s overall energy level. This essential vitamin protects your dog’s cardiovascular system and promotes healthy metabolism. The niacin in shrimp contributes to proper blood circulation, brain function and healthy skin. Phosphorus in shrimp is important for healthy bones. Shrimp also contains antioxidants which are indicated to reduce brain aging. Do Dogs Need to Eat Shrimp? You might be thinking, Wow, my dog needs to eat more shrimp! But the key nutrients found in shrimp are also found in other protein sources including commercial dog foods and treats. Therefore, your dog does not need shrimp to maintain a healthy diet. In fact, while shrimp options are plentiful in cat foods and treats, these meaty crustaceans are only found in a handful of commercial dog foods. Even then, they are often in the form of shrimp meal versus whole shrimp. Blue Wilderness brand carries a small selection of high-protein dog foods and treats containing shrimp meal. Canidae and Under the Sun brands each carry a salmon and shrimp option that contain shrimp in a salmon and chicken-based wet food. Can Dogs Eat Raw Shrimp? Dogs should not eat any raw shellfish. The U.S. Food and Drug Administration advises that eating raw shrimp is hazardous because raw shrimp may contain parasites. Also, consuming raw shrimp puts your dog at high risk for contracting a foodborne illness. If your dog has eaten raw shrimp, watch him closely for signs of stomach upset. Contact your veterinarian if you notice any unusual behavior such as dizziness, vomiting or diarrhea. You may also wish to contact the Pet Poison Helpline, endorsed by the American Kennel Club. Note: this is not a free service. Can Dogs Eat Shrimp Tails? Dogs should only eat the meat of shrimp. Both tails and heads should be removed prior to feeding. Can Dogs Eat Shrimp Shells? Just like heads and tails, the shell portion of the shrimp should be discarded prior to providing shrimp to your dog. Particularly in small dogs, bits of shell can cause impaction. If the shells are sharp, they can theoretically cause damage or irritation to the intestines. If your dog has eaten shrimp heads, tails or shells, monitor his bowel movements for constipation or bleeding and to be sure the shells pass uneventfully in a reasonable period of time. Can Dogs Eat Cooked Shrimp? If you are going to feed shrimp to your dog, cook it thoroughly first, or buy pre-cooked shrimp to feed him. Can Dogs Eat Boiled Shrimp? Yes. In fact, boiled or steamed are the best preparations of shrimp for dogs. Boil or steam shrimp until it is firm and pink with a little white. Your fishmonger or the package directions will advise you of the correct duration of cooking required, depending on the size of the shrimp. If you’re preparing shrimp for yourself or others as well as your dogs, prepare them separately. Set aside some clear water for boiling shrimp for dogs, and do not add any salt or spices to it. Can My Dog Eat Breaded, Fried or Sauced Shrimp? It’s best to avoid coatings or cooking methods other than boiling or steaming. Frying, breading, seasoning and sauces often add extra unneeded flavorings and salt to your dog’s diet. Even if you remove the breading from shrimp, it can still have residual additives that are unhealthy for your pup. After boiling or steaming in clear water, remove any part of the head, tail and shell and allow the shrimp to cool completely before offering it to your dog. Offer small dogs cut up pieces of shrimp; larger dogs can generally handle the whole shrimp at once. Since shrimp come in different sizes, you might feed your dog three little shrimp or one jumbo shrimp. This is a snack, so measure according to your dog’s regular treat size portion. They are a bit messy to handle, so you’ll need to have some wet wipes on hand for your fingers once training is over! You’ll also need to make sure that you keep the shrimp fresh. You can put cooked and frozen shrimp into your treat bag or pot, just be sure to use them within an hour or two. If you buy raw shrimp, make sure it is free from black spots and ask if it has been frozen. Once shrimp has been frozen and thawed, the texture and flavor will diminish with refreezing. Raw shrimp can be safely refrigerated for one to two days or frozen for three to six months. Cook fresh shrimp within two days of purchase and frozen shrimp within two days of thawing. Cooked shrimp should be refrigerated and eaten no more than three to four days after cooking. If your dog is lucky enough to have a shrimp snack, limit it to a couple of shrimp, a couple of times per week. For dogs with certain health issues, it’s best to avoid shrimp altogether. Feed your dog only fresh and fully-cooked shrimp, either boiled or steamed in clear water. Do not feed shrimp heads, tails or shells to your dog. Watch your dog for any signs of shrimp-related food allergy or sensitivity and contact your veterinarian if you suspect a problem. Do you give your dog shrimp as a treat or training reward? Share your experience in the comments.